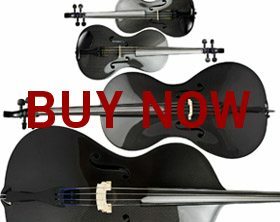 Finally, after centuries, there has been an innovation to the design of the viola, which eliminates the need to have the instrument be as long as the violist can handle. 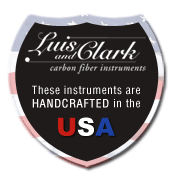 The corniceless design of the Luis and Clark viola has brought about an instrument that is light, easy to handle and has an astonishing sound. The viola has an amazingly beautiful, dark, yet vibrant resonance. It sings out effortlessly and powerfully. Weighing only 1 pound 4 ounces, the viola is much kinder to the body than traditional violas. It is 11/32 of an inch narrower on the A string shoulder, making it easier to play in the upper positions. When our daughter was thirteen and 5’ 2”she found it much easier to play than her ¾ sized wooden counterpart, which weighed twice as much. The lower registers are rich, the upper register has luxurious warmth and there is an evenness of sound across the strings. The overall tone is one of depth, power, beauty and resonance that has to be heard to be believed. This has the potential to eliminate viola jokes once and for all. At 16 ⅜” and weighing only 1 pound 4 ounces, this viola is much kinder to the body than traditional violas. The light weight of this instrument reduces muscle strain and is much easier on the neck and jaw for players who regularly play for long sessions. You will be stunned by the easy power and deep, reverberant tone that comes from such a reasonably sized instrument. Its sound is gorgeous, and one that you would expect from a much larger viola. It has a very warm tone and a sweet singing upper register. The cornice-less design of the Luis & Clark viola has brought about an instrument that is light, easy to handle and has an astonishing sound. The viola’s neck smoothly meets the sides and body of the instrument, rather than protruding out. The upper right hand shoulder is slightly decreased in an asymmetric design which favors the left hand as it moves into the upper positions, giving the violist more room to move around. The cornice-less design makes bowing easier as well, especially on the upper strings and when bowing at the frog. Much lighter than wood (and without an ebony fingerboard weighing it down), this viola that can be held up for hours with minimal effort. This is quite possibly the most beautiful sounding viola you will ever hear! Free Delivery in Continental US. To purchase, please continue through checkout online.